By Laura Jesse, Plant and Insect Diagnostic Clinic, and Daren Mueller, Department of Plant Pathology and Microbiology. Soybean samples have been arriving almost daily at the ISU Plant and Insect Diagnostic Clinic this year. Early season problems were primarily damping off diseases and problems with herbicide carryover or sometimes a combination of the two. 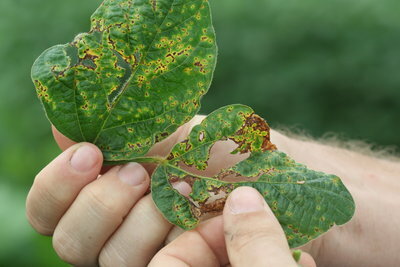 Brown spot — common foliar disease that starts in the lower canopy. Fairly easy to find in most fields in Iowa. Photo: Bacterial blight. Courtesy Daren Mueller. Bacterial blight — common foliar disease that often appears after thunderstorms, which we have had plenty. While this disease is usually one of the more simple diseases to identify, some fields have so much disease it makes us doubt what we are seeing. 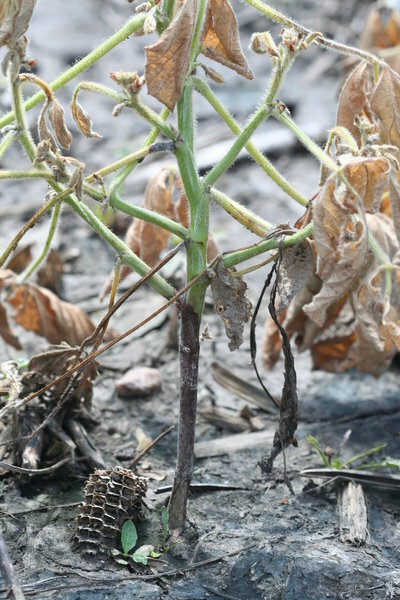 Sudden death syndrome (SDS) — yes, it is a bit early to see SDS, but there have been scattered reports of SDS across the state. Look for yellowing between the veins. Split the stem or look for lesions on the outside of the stem to confirm it is SDS. Photo. 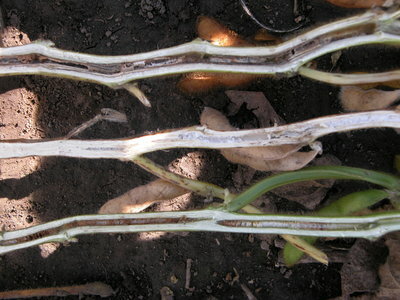 Brown stem rot. Courtesy of Craig Grau. Brown stem rot (BSR) — one report of BSR has come into the clinic. Split stems and look for the brown pith to properly identify this disease. Photo. Phytophthora root rot . Courtesy of Daren Mueller. Phytophthora root rot — with the overly wet fields, there have been scattered reports of this disease across Iowa. Look for the purple lesion on the lower stem that extends below the soil line. Photo. Stem canker . Courtesy of Craig Grau. Stem canker — with the very wet spring, be on the look out for this disease, as it will show up a bit later than the others. It will cause a distinct lesion on the stem (thus the name). At times, you may see similar foliar symptoms as SDS or BSR, but eventually the plants will die and the leaves will remain attached. White mold — the cool, wet weather during this time of year is conducive for white mold development. Look for scattered dead plants or patches of dead plants with white, fluffy fungal growth on the stem. 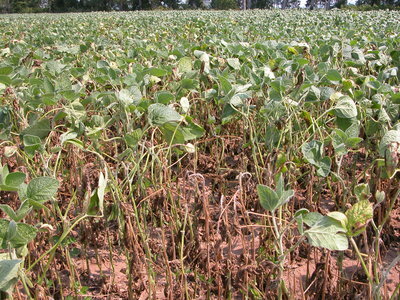 A more extensive article on white mold was written in early July. While many of these diseases can be accurately identified in the field, for some it helps to have a second opinion to confirm the disease. Samples can be sent to the ISU Plant and Insect Diagnostic Clinic, where we have the tools in place to confirm specific diseases. Soybeans do not travel in the mail as well as corn so care must be taken when shipping samples to the clinic. Following these tips will help ensure we receive a good sample. When samples arrive dried out or overgrown by mold it can be very difficult to isolate any plant pathogens. By definition plant pathogens feed on live plant tissue and once tissue is dead it can be very hard to diagnose problems. Collect at least 3 plants (including roots) showing symptoms. If plants are large it is ok to fold them so they fit in a box. Collect plants that are not wet with rainfall or dew as they will not travel as well. Keep plants chilled or in a refrigerator before you send them. Try not to let them sit in a hot car after collecting. Seal plants in a plastic bag prior to shipping. Do not seal the bag if plant leaves are wet. Ship samples early in the week so they arrive before the weekend. Both FedEx and UPS will ship samples directly to the clinic. Overnight or second-day delivery is advised especially if weather is forecast to be hot. Please include our form with a detailed description of what you are observing, the patterns in the field, a history of chemical use in the field, and anything else that might help us understand the situation. When samples arrive in the clinic we examine the sample, read the form and often consult with other specialists. Diagnosing plant disease requires we consider the whole situation. Often stressed plants are more prone to disease problems, so we need to take into consideration possible stressors when diagnosing a disease problem and making any management recommendations. Some disease can be diagnosed fairly quickly by examining the symptoms the disease causes in the plant or by looking at the spores or other signs under the microscopes. However, many diseases require additional testing. To confirm many diseases, particularly early season damping off diseases, we have to 'plate for it' which means that we take part of the plant tissue and place it in a petri dish with some type of agar that helps certain pathogens grow. Depending on the disease, this process usually takes about 7-10 days. Samples can be dropped off at the campus office located in Bessey Hall, room 327. Clinic hours are 9:00 a.m. to 4:00 p.m., but it is best to call ahead, 515-294-0581. Laura Jesse is an entomologist with the Iowa State University Extension Plant and Insect Diagnostic Clinic. She can be reached at ljesse@iastate.edu or by phone 515-294-0581. Daren Mueller is an extension soybean pathologist and assistant professor in the Department of Plant Pathology and Microbiology. He can be reached at 515-460-8000 or dsmuelle@iastate.edu. Links to this article are strongly encouraged, and this article may be republished without further permission if published as written and if credit is given to the author, Integrated Crop Management News, and Iowa State University Extension and Outreach. If this article is to be used in any other manner, permission from the author is required. This article was originally published on July 15, 2014. The information contained within may not be the most current and accurate depending on when it is accessed.